Me, happy in the VR Garden… I love drawing in Virtual Reality! VR Garden started with a few drawings of flowers in Vritual Reality (VR). VR Garden was my first post on Poly, August 3, 2017. A member of my local community generously loaned Better World Museum an Oculus Rift for one year. I downloaded Tilt Brush, and immediately loved drawing in VR. The controller became an extension of my hands, which at times have felt less powerful. Drawing VR Flowers made me feel free, like I had giant wings, I felt actively engaged and happy. Plus, I never ran out of paint or space. My canvas was now as large as the world! I knew I wanted to share this positive feeling with others, but it was more.. I felt a deep obligation to share it with as many people possible. I knew right away that this was a powerful tool to create change and connect communities. Feeling happy, I drew more flowers. Once uploaded, learned I was able to share a link to anyone in the world on social media. The file had an option for people to ReMix the drawing. I loved that idea! Often feeling isolated, and not included in professional, social, and community activities made me strive to facilitate creative opportunities to include more people. I try my best to make each voice feel valued, especially members of vulnerable communities. I saw Tilt Brush’s ReMix option as a way to include more people and create space for growing better together — especially after the last American election when people needed more hope and joy, feeling connected and loved. VR Garden was created and shared, as a bed of fertile ground for people to draw together as a global community, and grow better together. After I posted a link on social media inviting the public to contribute to Vr Garden by drawing something in the garden, or ReMixing it completely, I felt pretty good. However, shortly after posting, a guy visited the museum who I shared the concept with. He explained (eye-roll), what a bad idea it was, and how I would just receive hate speech and symbols of violence or oppression. I didn’t believe him at all.. and perhaps naively, trusted in humanity. 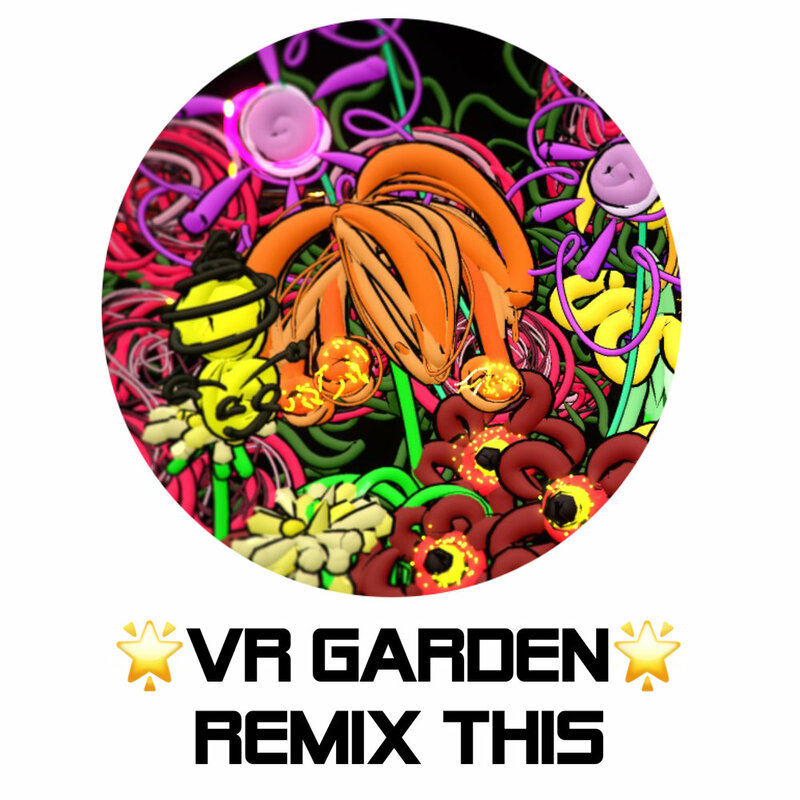 People stated to add to and ReMix @VR Garden, first one person, and then another! What I saw in VR Garden was something beautiful, I was not disappointed!!! People from all over the world added to the VR Garden. People from Ireland, Japan, California, Arizona. People who were Muslim, Jewish, Christian, Disabled, Young, Old, Homeless, even a Holocaust Survivor contributed to the VR Garden! One person, Ali Brahremand worked for days ReMixing the VR Garden into a beautiful environment for his Mother, it’s really lovely! 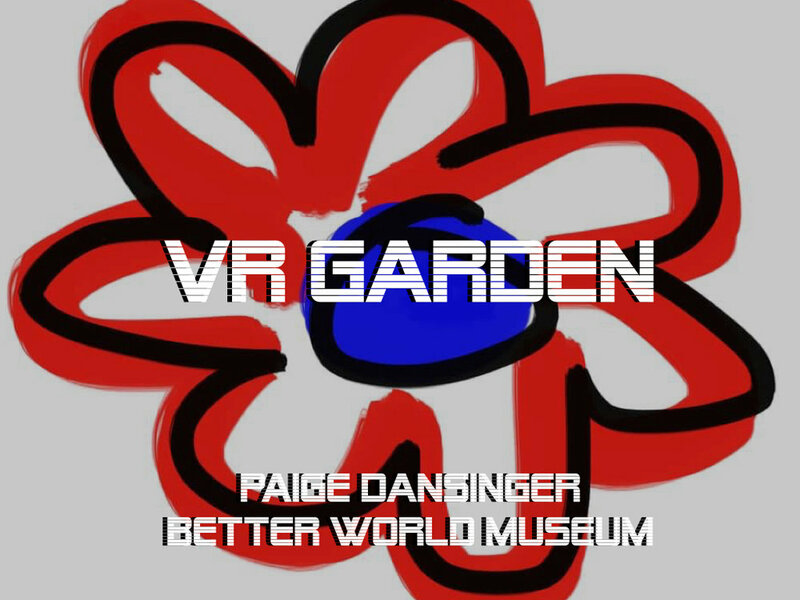 More Artists and VR enthusiasts contributed online, and visitors to Better World Museum where invited to learn to draw by contributing in the VR Garden. It was included in TEDx Minneapolis, 2017. I believe we can include one billion people in the VR Garden. My goal is to draw with people in every region. I want to sync the drawings on digial bilboards in cities and public spaces, museums, libraries, and airports. The entire world will draw togethr to grow a better world. Today, people all over the world are participating in the VR Garden. It's a public art activity to create community, and grow better together. 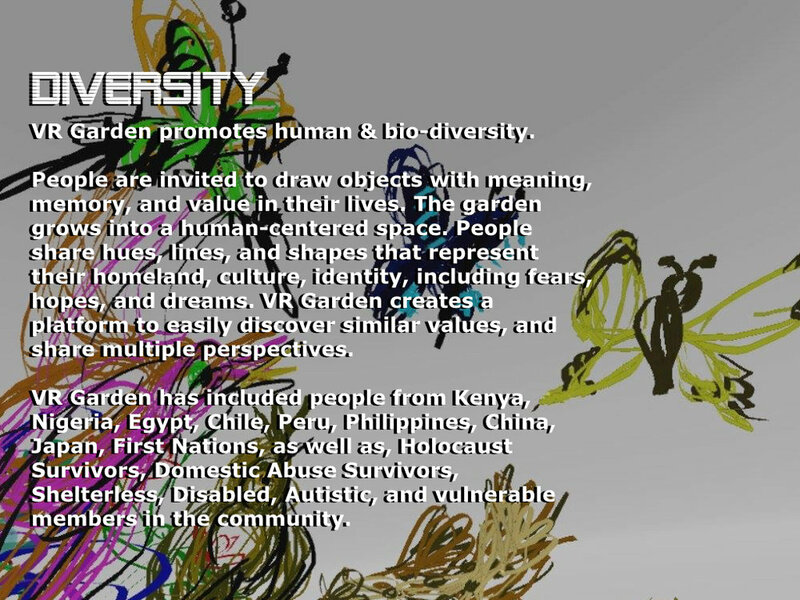 VR Garden is about creating inclusive space, honoring human & bio-diversity, raising empathy, supporting vulnerable voices, cultivating earth stewardship, and harvesting individual, local, and global wellness. VR Garden is a movement with purpose to raise empathy, connect people, and work towards including up to one billion people! We can grow better together with VR Garden!! The following examples will share some of the ways we will include everyone. Together, we’re creating a movement!! Engagement and Education are important missions of VR Garden..**Poisonous Plants, do not eat these common garden flowers: Lily-of-the-Valley, Irises, Bleeding Hearts, Azaleas, and Peonies. Ideal for proposing to visit new communities with an easy to travel with Oculus Go! In 2019, I plan to visit Hong Kong, China, Cambodia, Singapore, Manilla, Indonesia, California, Seattle, New York, London, and more places to draw VR Garden with women & children, underserved, and creative tech communities. This presentation deck helps share the vision! Join @VRGarden Group on Facebook! Connect with members, create new friends and share your drawings too. VR Garden’s Facebook Group is where people are growing together. Participants included members from 46 countries, including Kenya, Philippines, Peru, Chile, Brazil, Egypt and more! I have the honor of being among 115 amazing members of Facebook Community Leaders Fellowship Program. Members of 46 countries gathered recently. My intention was to share VR Garden, empowering people to draw in Virtual Reality, with as many people from around the world as possible. I teamed up with more VR enthusiasts and we facilitated VR demos in the hotel lobby and lounge areas each evening. One afternoon at Facebook HQ we led a VR Workshop! 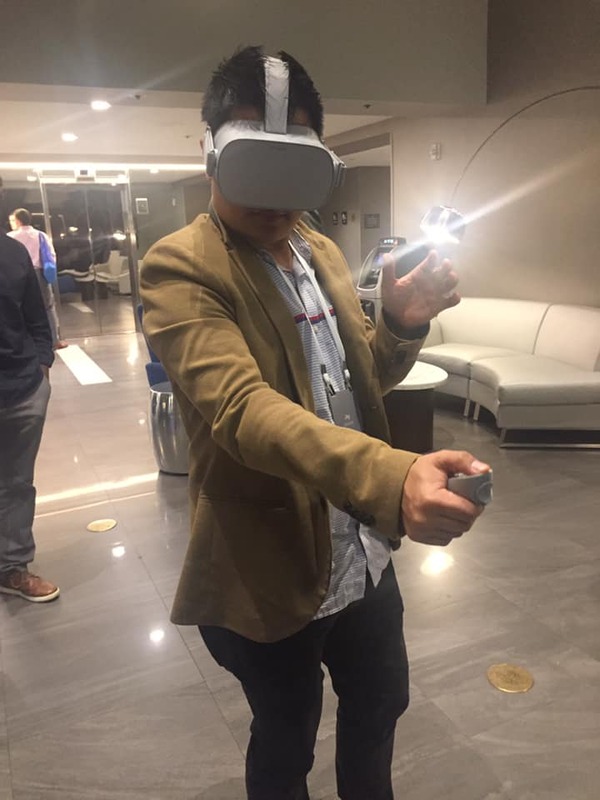 It was great and natural to be sharing this technology in the company that owns it, I have expert experience at educating people how to draw in VR. I brought my Oculus Go with me wherever we went, so people could even draw on the bus-rides between our hotel and Facebook. Everyone had several opportunities to draw in VR Garden. The people who tried it loved it and now want their own Oculus headsets.. I believe if they had them that now, having experienced drawing in the VR Garden, they would create - rather than just consume the content. This VR Garden was created at the Facebook Community Leadership Program MeetUp #1. Representitves including members of 46 countries tried Oculus Go for the first time. Each person now feels confident in drawing in VR and feels connected to each other. Inviting you to draw, paint, sketch, decorate a cake, or create a poem or meditation. Any medium will be included to the AR/VR Tree of Life Public Art Mural. On the new Facebook Group @VRGarden, I may ask “What is your favorite bird or butterfly?" or “Name a Tree” — Participants share what they love. I draw their contributions in a shared space to welcome, engage, and include everyone. I drew these 3D objects in Facebook Spaces for friends! Education & Engagement are vital to the growth of VR Garden! 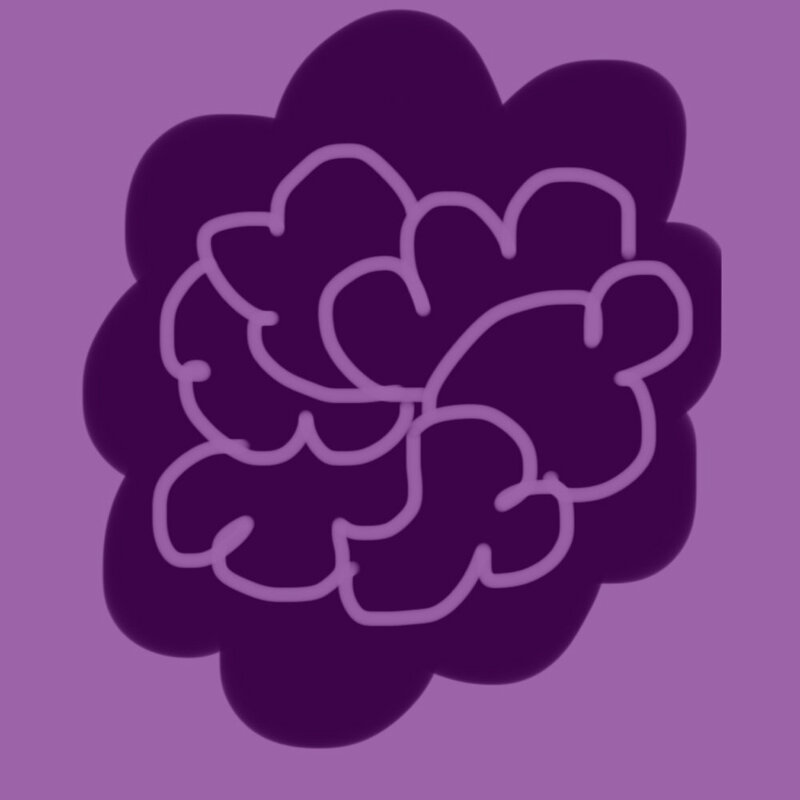 Scientific Botanical Drawing of Violet, An Urban Edible Plant. 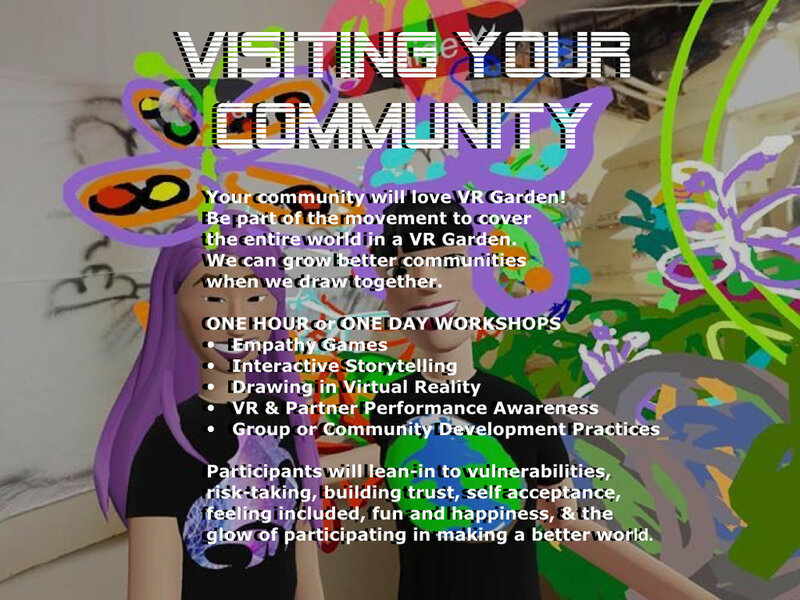 VR Garden is a place for sharing togetherness, creating connection & community. It’s a place for growing relationships & friends. 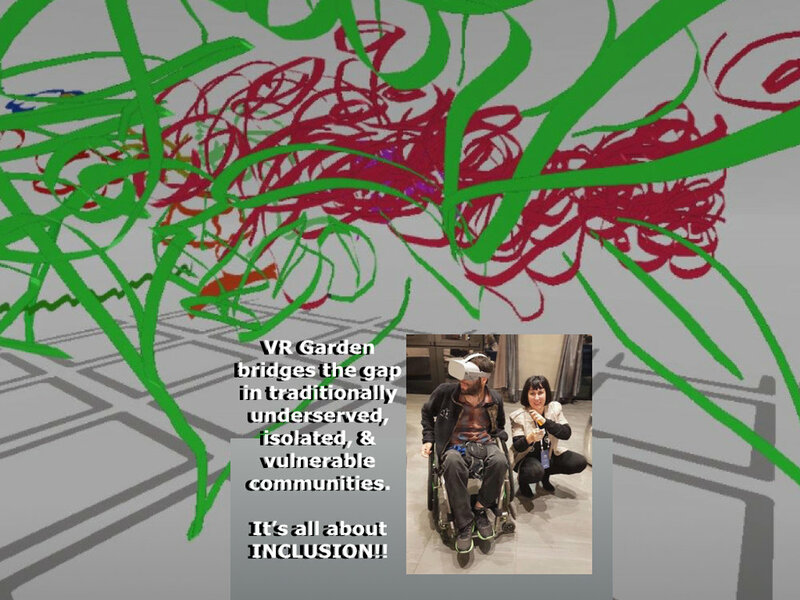 VR Garden strives to break barriers, walls, glass ceilings, and create more inclusive opportunities through practice, creating better programs, and human-centered design. Drawing with Alvaro Silberstein, co-Founder Wheel the World, in the VR Garden. We’re creating a Rosebush together! Rosebush. Created with Alvaro Silberstein in the VR Garden. VR Garden created at Oculus Connects #OC5 with new friends! 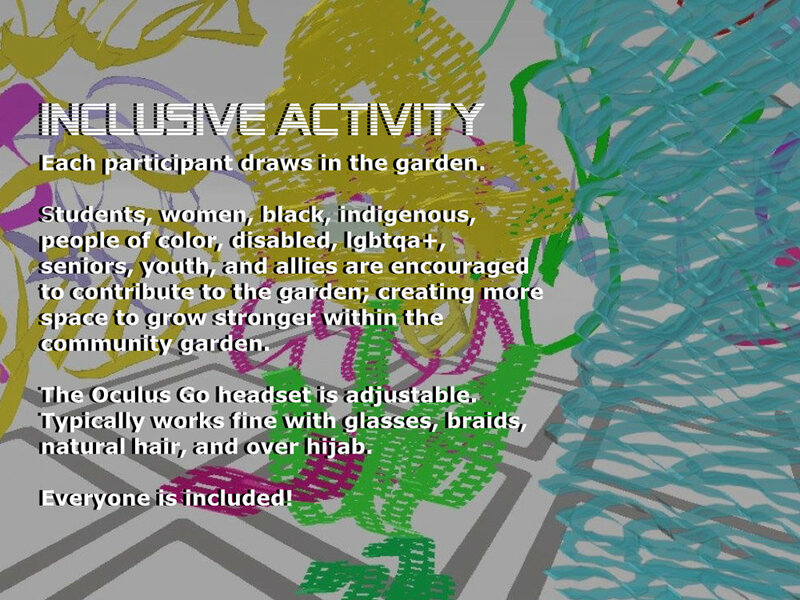 VR Garden created at #OC5 with many friends of ARVR Women and Allies at Oculus Connects. Original VR Garden - I drew a few flowers & shared them online.. I invited anyone in the world to contribute or Remix. Created with people around the world! Included in TEDx Minneapolis, Jump Into VR Fest (NYC), and performed Live in Venice Beach (LA). Created by public participants inside of TiltBrush. Women from the Sacred Leaders & Ginew/Golden Eagles from the Minneapolis Native Indian Center visited Better World Museum and contributed to the VR Garden. I have had the honor of drawing several times in VR with the Golden Eagles. Dedication to creating community relationships, and sharing the amazing power of Virtual Reality, has served to cultivate a healthy and beautiful growing relationship together. 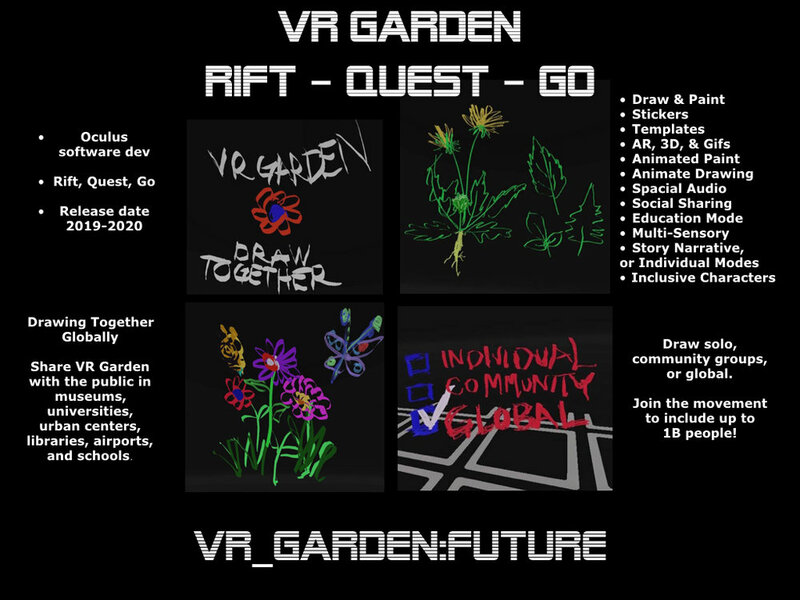 Read more about drawing together in Tilt Brush, and in VR Garden. Local Artists ReMixed my videos of VR drawings of urban edible plants, originally created with Tilt Brush in an Oculus Rift. I wanted to include more community members in a project for an art festival. I commissioned four local Artists to ReMix my VR artwork. This helped create a team of event volunteers as each wanted to participate and felt invested in the success of the evening. All the Artist and Teen Tech Members were compensated for their ReMixes and drawings in Tilt Brush — their work is valuable!!! Read Better World Museum’s blog post about Urban Edible Plants at Northern Spark Art Festival. Remixes by Hattie Ball, Madeline Hendricks, Kat Moon, Brian Skalak from Urban Edible Plants for Northern Spark Art Festival. Original VR drawings created in VR Tilt Brush by Paige Dansinger as Artist-in-Residence for Minneapolis Athenaeum. Raquie, member of Best Buy Teen Tech Center snaps her VR Urban Edible Plants at Northern Spark (June, 2018). Since then Raquie has participated in exhibit Support Structure at Better World Museum, and contributed to Urban Edible Plant Walking Tours. Now she knows how to identify and uses for yarrow. It grows right outside the library on Nicollet Ave!! It’s not that I just like to draw with people... I feel a deep sense of responsibility to share Virtual Reality with as many people as possible. As a first-gen VR Artist, it is like having the first pencil and wanting to share it with people around the world. 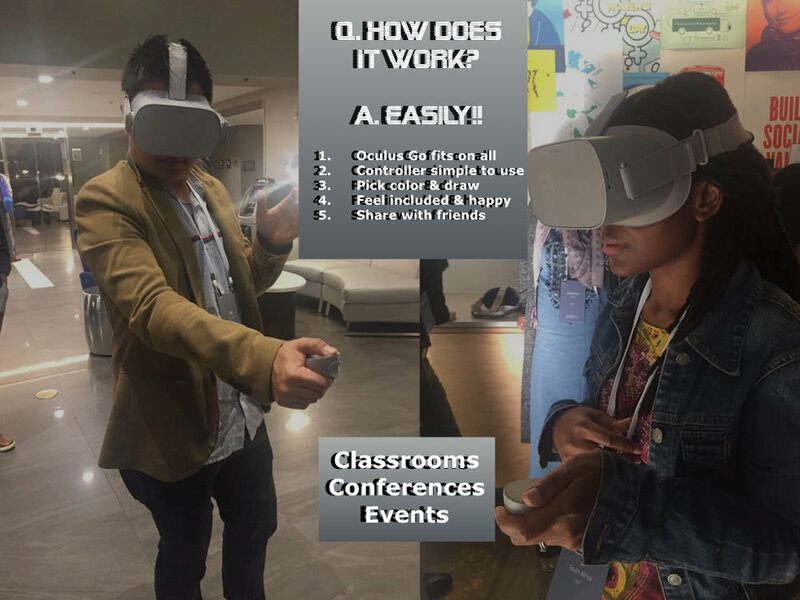 It’s important to me that especially diverse youth may have more opportunities to experience VR, and envision themselves as active content creators and educators, rather than passive consumers. People drawing in VR Garden. Member of the Teen Tech Center at Minneapolis Central Library scales the file for Bindweed AR/VR Flower Patch. After Bindweed, Mary Delany, 1776 at British Museum. Published in “Mrs. Delany: Her Life and Her Flowers” Ruth Hayden, (1980), Minneapolis Athenaeum. Read more about the Flower Patch Project. One awesome week sharing VR Garden! Young members of the Teen Tech Center, at the downtown library, and I made embroidered flower patches together. I was invited to be in an art show, Impetus! curated by Museum of Impact, at the Brooklyn Public Library in Williamsburg, Brooklyn, New York. Excited to be connected to another library, I wanted to represent our community and bring the teens artwork with me. I created two giant AR/VR posters for the exhibit inside the library> I wanted to bring AR/VR into the streets on New York, so organized an Urban Edible Plant Walking Tour. People loved eating the plants, and seeing them pop out of my iPhone & posters! Earlier in the same week I was excited to go to Oculus Connect #OC5 in San Jose, California. I knew at the two events, on each coast, I would talk and interact for just a few minutes with 100’s of people. I decided to make 300+ heat-press printed AR/VR Patches, so I could give one to each person I met. I was so glad I did!! I was able to share our story about the brilliant teens in our community, and share our cool work together with many people and make super nice new friends! Better World Museum created an AR app using Unity + Vuforia to activate drawings created in Tilt Brush. These photos show the wonderful week. Click on each to read the descriptions. Red Opium Poppy, for Impetus! At Facebook Spaces, Menlo Park, CA. I gave everyone a patch and each person tried the AR! On to NYC for the Urban Edible Plant Walk wearing my AR shirt! They love it! Robin & Casey enjoyed some more! Demonstrating AR/VR Posters in my AR/VR Clothing in another library! Connecting the world with a growing garden! AR/VR Garden Fashion shares life in the streets. Urban edible plants were drawn with members of the Teen Tech Center at the downtown Minneapolis Library using Tilt Brush. Better World Museum is working on creating an app with Unity + Vuforia. Here’s a demonstration of the VR drawings popping right off the shirt! These drawings in Virtual Reality are inspired by the botanical prints of Mary Delany (1700-1788). She was 15 illustrations shy of creating 1000 paper collage illustrations (she called them her paper-mosaicks and thought she invented a new art-form), when she was too old to work. Her folio is collected in it’s entirety at the British Museum. After a life of research and dedication to the Artist, one of her relatives published, “Mary Delany: Her Life and Her Flowers” by Ruth Hayden (1980), at Minneapolis Athenaeum. AR/VR Artist-in-Residence at Minneapolis Athenaeum uses Tilt Brush to draw works inspired by their collection by 17-20th C. female Botanical Artists. Hollyhock, Alcea Rosea (Monodelphia Polyd). Mary Delany, (1779), British Museum. Published in "Mrs. Delany: Her Life and Flowers", Ruth Hayden, 1980, Minneapolis Athenaeum. Inspired by Botanical Artist Mary Delany (1700-1788), Minneapolis Athenaeum's Artist in Residence, Paige Dansinger, draws Fresh Flowers in Virtual Reality using Google’s Tilt Brush.